Vladimir Borovikovsky, one of the talented and original artists of the late eighteenth and early nineteenth centuries, was born in Mirgorod, in the Ukraine. His father was a Cossack, and almost all the members of his family served in the Mirgorod regiment. Following the family tradition, Vladimir went into military service, but having attained the rank of lieutenant he retired and devoted himself entirely to art. The budding artist learned the first skills of painting at home. His father, uncle and brothers all did icon-painting when they were not busy with their regimental duties. The Kiev Museum of Ukrainian Art and the RUSSIAN MUSEUM in St.Petersburg both contain some icons painted by the young Borovikovsky. These early works testify to the artist’s mastery of certain skills of eighteenth century icon-painting, but on the whole they are still on the level of craftsmanship. Real mastery came later, in St. Petersburg. Catherine II’s visit to the Crimea in 1787 was decisive in bringing about a change of fate for Borovikovsky. The well-known eighteenth-century poet, V. Kapnist, then marshal of nobility in Kiev Gubernia, asked the artist to decorate one of the rooms in which Catherine was going to reside. Borovikovsky painted two large allegorical paintings—evidently with considerable skill, and he was invited to St. Petersburg. On 20 October 1787 he signed a deed on the division of property bequeathed by his father and left Mirgorod for ever. For the first ten years the artist lived with N. Lvov, a well-known architect and a man of varied interests, keen on poetry, music and archeology. His house was a meeting-place for many eminent figures in Russian culture. Borovikovsky found himself in the company of poets whose interests and ideas were linked to the new wave in literature—sentimentalism. Karamzin’s Letters of a Russian Traveller and Poor Lisa had been published, the poet Dmitriev was writing his sentimental verses, and lyrical notes were to be heard in the poetry of V. Kapnist. This line in literature was reflected in the art of Borovikovsky. 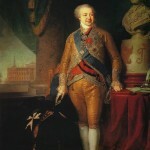 In St. Petersburg Borovikovsky became a good friend of Dmitry Levitsky and possibly studied under him. From 1792 he was taught by I. Lamni, who gave him his studio when he left Russia. Here Borovikovsky lived and worked for the rest of his life. In more than thirty years of strenuous work in the capital, he painted hundreds of works. From his teachers he learned a brilliant technique, a light, transparent style, and mastery of compositional devices. At the centre of his attention was man’s inner world and unique individuality. In his portraits, the image as a whole was subordinated to his ideal of a pure, poetic personality with an elevated soul. The pose, the positioning of the hands and the landscape were all a kind of setting for the model’s face. Borovikovsky developed a distinctive style, in which softly playing mother-of-pearl shades and a smooth surface like porcelain were combined with precision of drawing and classically severe lines. 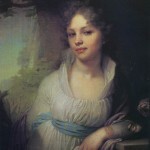 One of the artist’s best early works is his delightful portrait of O. Filippova (1790, RUSSIAN MUSEUM, St.Petersburg), the wife of one of Borovikovsky’s friends—an architect, who helped construct Kazan Cathedral. She is depicted against the background of a garden, in white morning dress, a pale rose in her hand. The image of the young woman is devoid of any trace of affectation or coquetry. Her facial features are distinctive; the almond shape of her eyes, the way her nostrils are drawn and the mole over her upper lip all lend particular charm to her face, which bears an expression of almost childlike tenderness and dreamy thoughtfulness. In the late eighteenth century the art of the miniature portrait was very widespread—a genre which combined lyricism and great intimacy (miniature portraits were commis­sioned in memory of near and dear ones) with decorative qualities. Borovikovsky worked in this genre at various periods, but particularly in his early years. The distinctive content of Borovikovsky’s art led him to work out new, more varied portrait forms. He did many double portraits and showed a propensity for small-scale, chamber works. 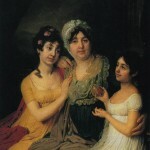 Such, for example, were his portraits of 1794, including Lizanka and Dashenka and Khristinia, the Peasant Woman of Torzhok (c. 1795, Tretyakov Gallery, Moscow), all portraying serfs owned by N. Lvov. These portraits certainly exhibit the same idyllic notes that can be “heard” in the study of Ye. Arsenieva (mid-1790s, RUSSIAN MUSEUM, St.Petersburg) and in the well-known portrait of Catherine II Walking in the Park at Tsarskoye Selo (mid-1790s, Tretyakov Gallery, Moscow). The portrait of Catherine II, walking with her favourite dog in the park, is unconstrained, even intimate. The image of the empress is not devoid of sentimentality, but what is important is that Borovikovsky portrays her not as a ‘goddess on Earth’ but in a normal domestic situation. It is significant that Alexander Pushkin was later attracted to this image: it was as just such a benevolent, majestic ruler that Catherine had to appear to the heroine of his story The Captain’s Daughter, the inexperienced, innocent, trusting Masha Mironova, who seeks the empress’s aid and patronage. One of Borovikovsky’s most mature lyrical works was his portrait of Maria Lopukhina (1797, Tretyakov Gallery, Moscow). The young woman’s attitude is relaxed and simple, yet refined and elegant. The harmony of the image results from the whole artistic structure of the work: the flowing lines, the movement of her hand, the rhythm of the trunks and branches of the trees in the shady park, the subtlest nuances of light and shade, and the gentle blue, mother-of-pearl colours, reminiscent of the magical sounds of a clavichord. But her beauty Borovikovsky has preserved. To love, to suffer, to forgive and to be silent. Borovikovsky’s male portraits were no less typical of the age. 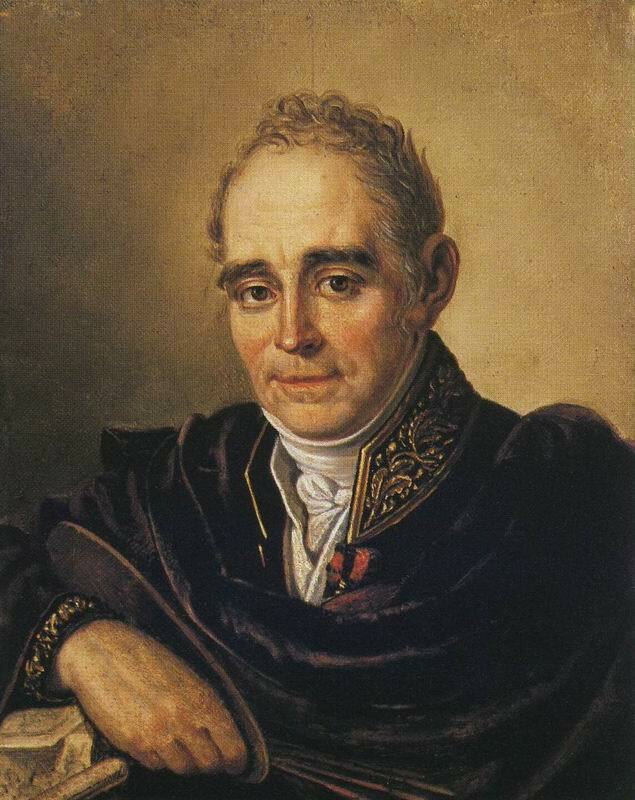 There is the serious, rather sullen aspect of D. P. Troshchinsky, Catherine II’s State Secretary (1790s, RUSSIAN MUSEUM, St.Petersburg), to whom the artist was attracted because of his uncommon intelligence and abilities. F. A. Borovsky is depicted as a courageous man, covered with the glory of Suvorov’s campaigns; his stern, energetic face is portrayed with great realism (1799, RUSSIAN MUSEUM, St.Petersburg). Official, full-dress portraits hold a special place in eighteenth-century Russian art, and Borovikovsky is no exception. Both in his work and in Levitsky’s, the full-dress portrait, whose main function was to glorify the subject’s social station, laid special emphasis on man’s inner world. This can be seen in the portraits of the Persian Prince Murtaza-Kouli-Khan (1796, RUSSIAN MUSEUM, St.Petersburg) and of the ‘diamond prince’ Vice Chancellor A. 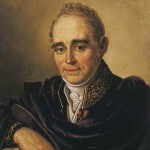 B. Kurakin, known as the ‘peacock’ because of his arrogance and love of ostentatious luxury (1801, Tretyakov Gallery, Moscow), and also in the well-known portrait ‘in dalmatic and purple’ of Paul I (1800, RUSSIAN MUSEUM, St.Petersburg), which was commissioned for the conference hall of the Academy of Arts. Borovikovsky, then, was equally at home with such monumental, commissioned portraits, and with lyrical, intimate works. In the early years of the nineteenth century the artist took part in the decoration of the Kazan Cathedral which was then being built. He painted ten icons. Borovikovsky was a charming person, gentle of character. His pupils—among the favourites was Alexei Venetsianov—lived in his house like members of the family. His relations constantly turned to him for help: he sorted out their quarrels and supported them morally and materially. Many decades passed before much public interest was shown in this great artist, but an exhibition in 1905 at which more than a hundred of his portraits were displayed helped to bring him into the public eye. After the Revolution 1917, works which had been scattered around stately homes and private collections found their way into museums and galleries and now give a fair idea of the rich legacy of this outstanding master.